John T. Downey talking in New Britain following his release from China in 1973. Connecticut Judge John T. Downey has died. Downey was the longest-held captive of war in U.S. history. Downey, born in New Britain, was an academic and sports standout at both the Choate School (now Choate Rosemary Hall) and later Yale University. He became a CIA operative immediately following graduation from Yale in 1951, at the height of the Korean War. Downey's first assignment was to train and deploy a team of Chinese agents to infiltrate that country's communist government. He was captured during that mission, and spent the next 20 years as a prisoner of war, the longest-held prisoner of war in U.S. history. 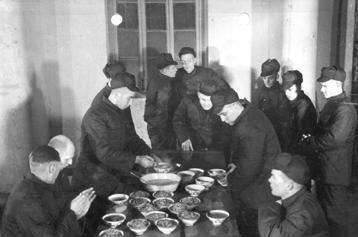 A Chinese propaganda photo released during John T. Downey's imprisonment shows Downey and fellow POW Richard G. Fecteau. In a recently-released CIA documentary, "Extraordinary Fidelity," Downey recalled the mental and physical torture he endured in the first few weeks of captivity, and the ways he found to cope with years of solitary confinement in a Chinese prison. "Around the third or fourth year in prison," he said, "I pulled myself together and said enough of this crap. The practical tool of coping was to be as busy as I could. I had my day scheduled right down to the last minute." Downey was released in March 1973, shortly after President Richard Nixon publicly acknowledged Downey's CIA connection. When Downey returned to New Britain, he was a celebrity, but he vowed to never reflect on his years in captivity. He stuck by that vow, few interviews, and even fewer details. But earlier this year on Slate.com, Downey provided the most detailed account to date of his years in prison to Slate contributor Andrew Burt, a Knight Law and Media Scholar at Yale Law School. 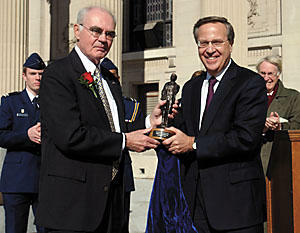 John T. Downey receives the Nathan Hale Award in 2005 from Yale University President Richard C. Levin. "Here was a man who played a key role in history, and could have very easily cashed in on his public persona," Burt said. "But instead, what I found when I got to know him was a quiet, quintessential public servant who's not in it for himself, and who seemed to get the most fulfillment dedicating his time and efforts to others." Less than six months after his release in 1973, Downey was enrolled at Harvard Law School. He became a lawyer and later a judge, assigned to preside in juvenile court. In 2002, the New Haven Juvenile Matters Courthouse and Detention Center was renamed The John T. Downey Courthouse. Last year, Downey was awarded the CIA's highest decoration, the Distinguished Intelligence Cross. John T. Downey was 84 years old.